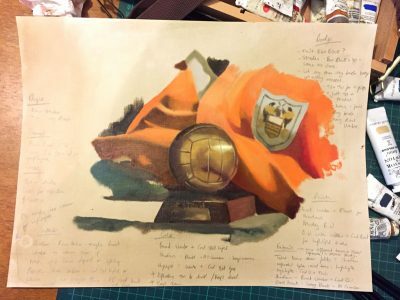 Football is Still Life is the latest project from Gary Armer where he is exploring the themes and narratives associated with historic and retro football memorabilia and fan cultures. 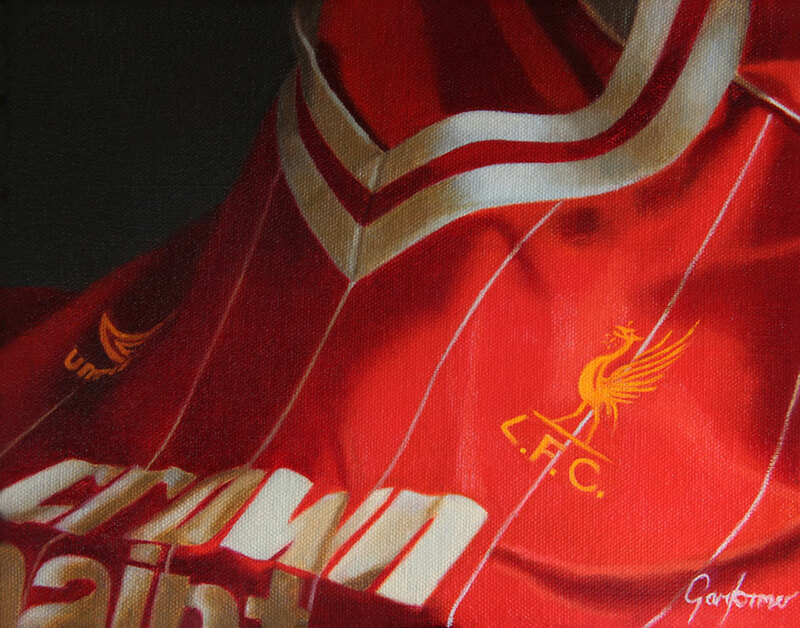 The majority of the oil paintings were painted from life using the sight-size technique and so far they feature football shirts, boots, collectables, pin badges and rosettes. 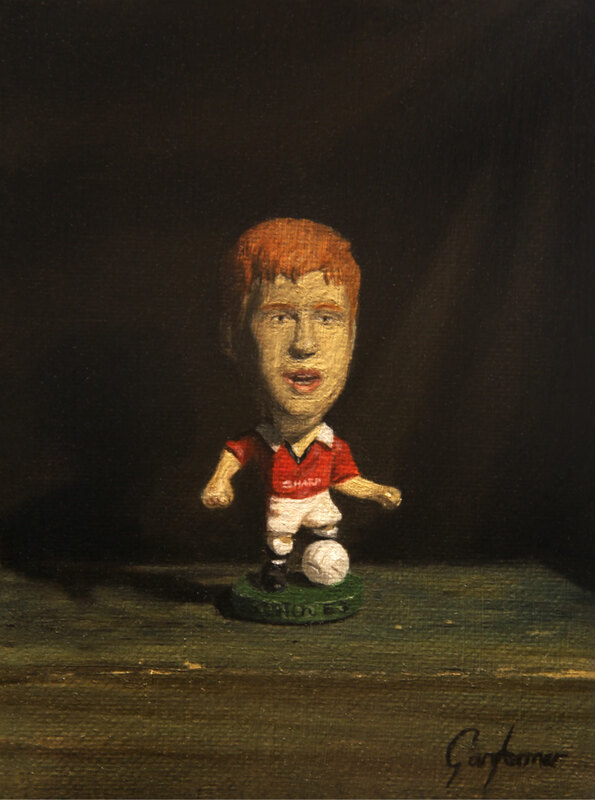 As part of the Football is Still Life project, Gary has consulted with football memorabilia experts and the National Football Museum in Manchester where the artist completed an artist’s residency. 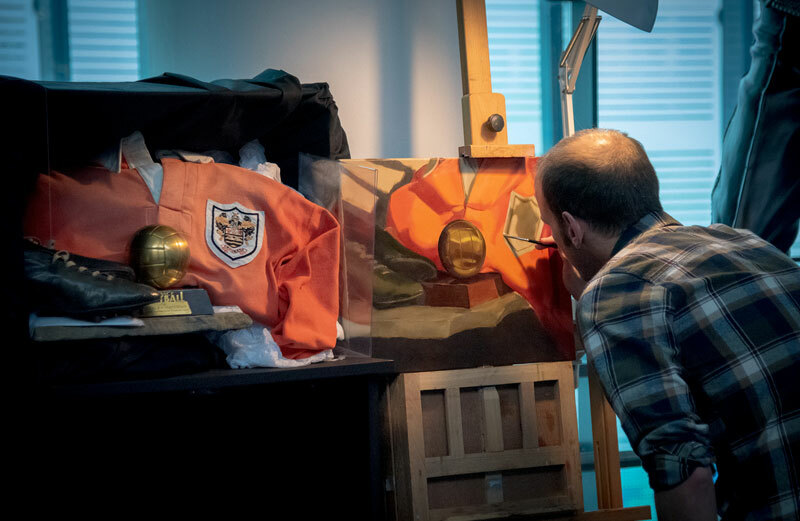 This residency added a new dimension to the project as the artist was given access to paint a still life featuring significant artefacts relating to the legendary Sir Stanley Matthews. 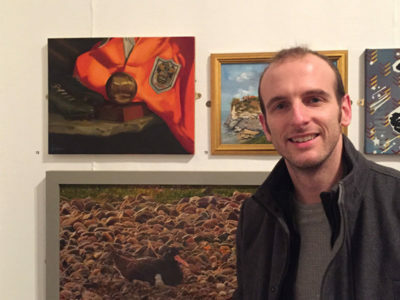 You can read all about the Football Museum residency here. 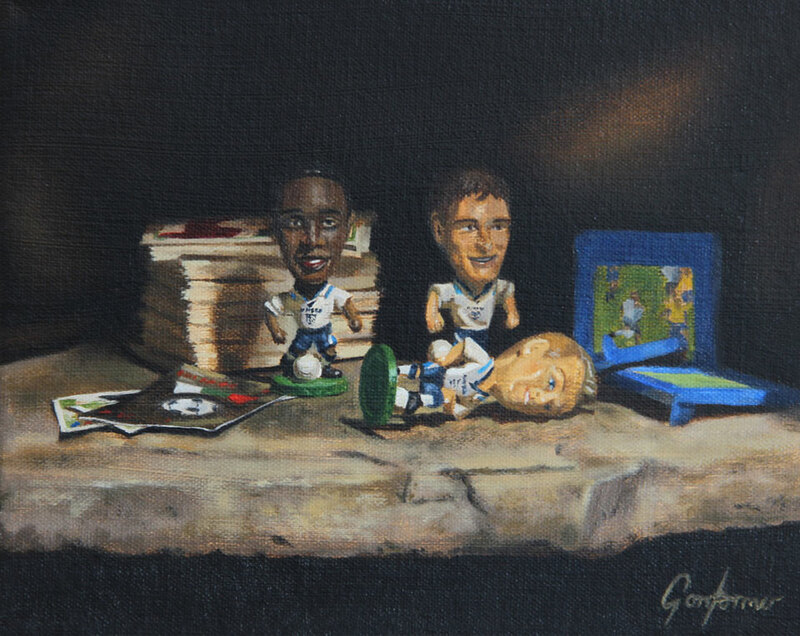 Notes | Southgate You’re the One tells the story of Gareth Southgate’s rollercoaster England career through retro collectible figurines which work as portraits within a still life. 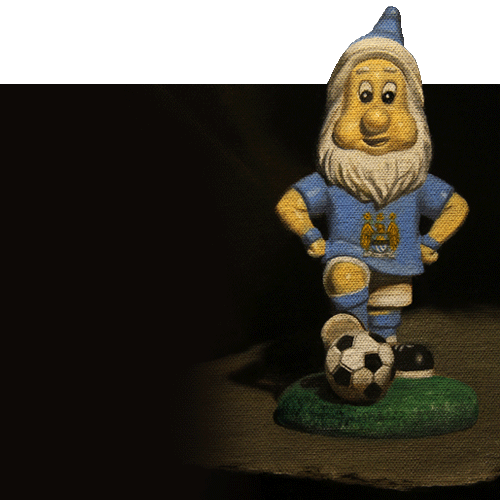 Notes | Tangerine Treasure features retro nineties and noughties football memorabilia from the artist’s own collection. 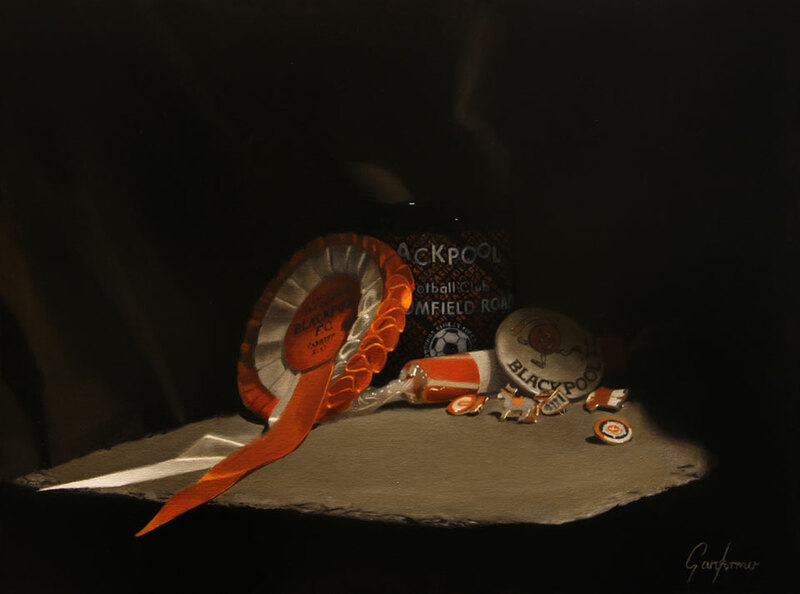 Rosettes, pin badges and mugs could be considered tat in many instances but when associated with a fan’s favourite team they take on another level of meaning and bring back memories of certain eras in their club’s history. 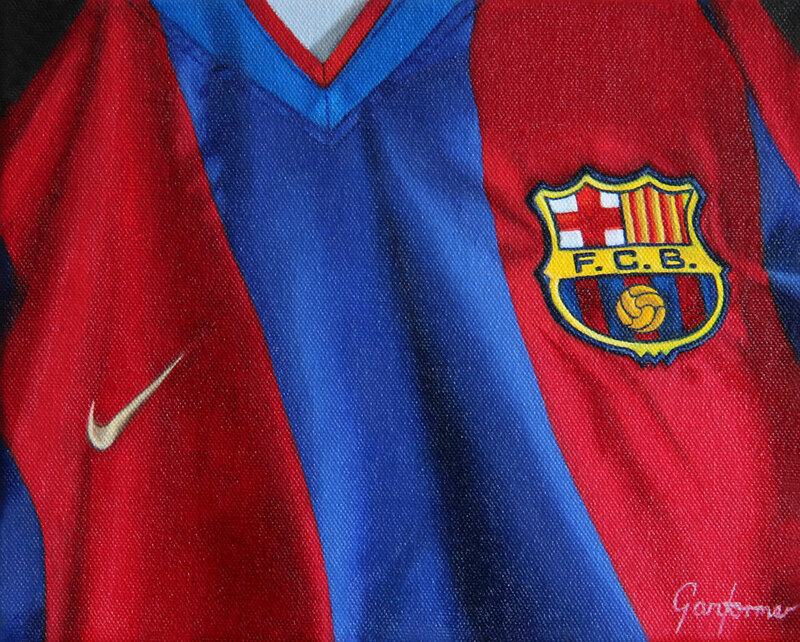 Notes | Painted entirely from life, More than a Club depicts the vibrant and iconic colours of a shirt so often associated with European Champions League success. 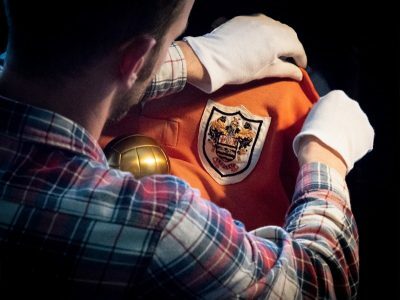 Notes | Football shirts can portray a point in a club’s history more clearly than most memorabilia. 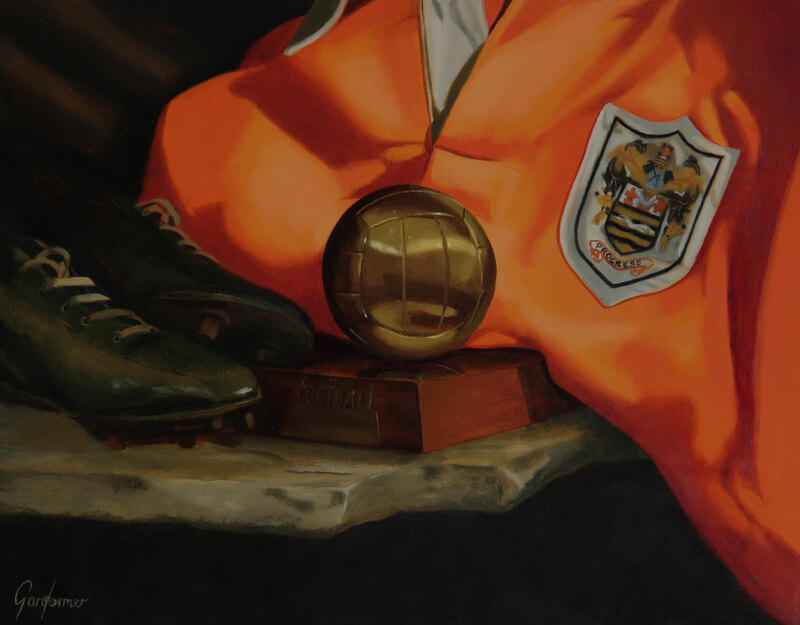 Painted from life in the artist’s studio, Crowned Champions features the iconic Crown Paints sponsored shirt of a team who dominated English football in the 1980s. 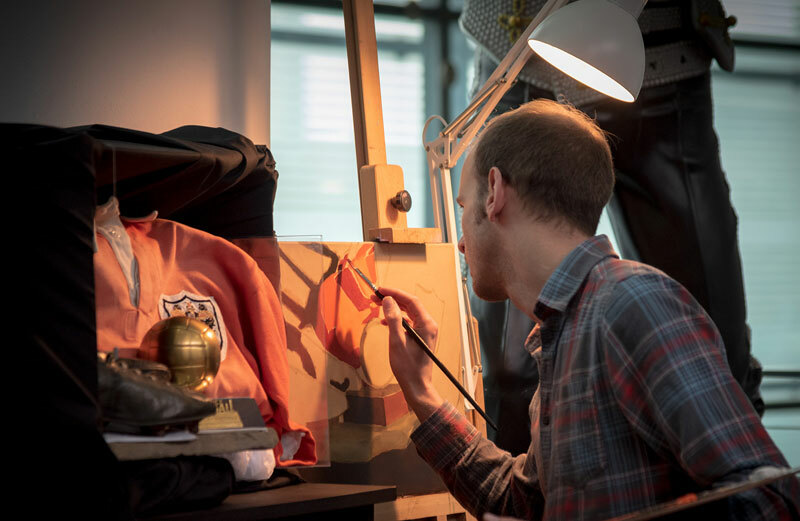 Notes | Painted entirely from life on an artist’s residency in the National Football Museum, Sir Stanley Matthews Still Life features the match worn boots and shirt from the legendary 1953 FA Cup Final as well as the player’s Ballon d’Or trophy from 1956. 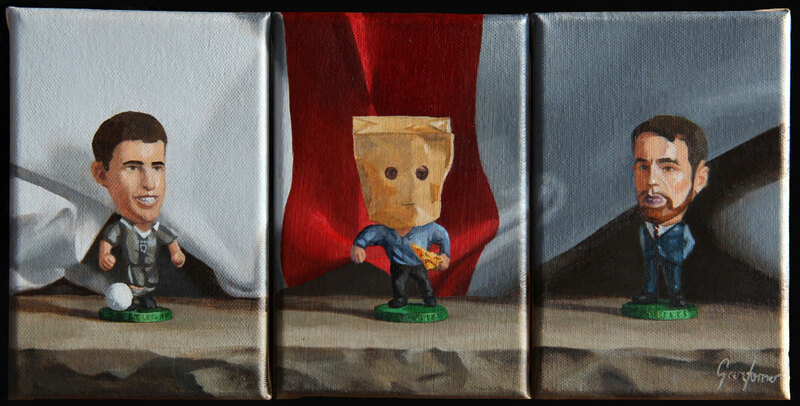 You can see photos and videos of the making of this piece during the residency here. 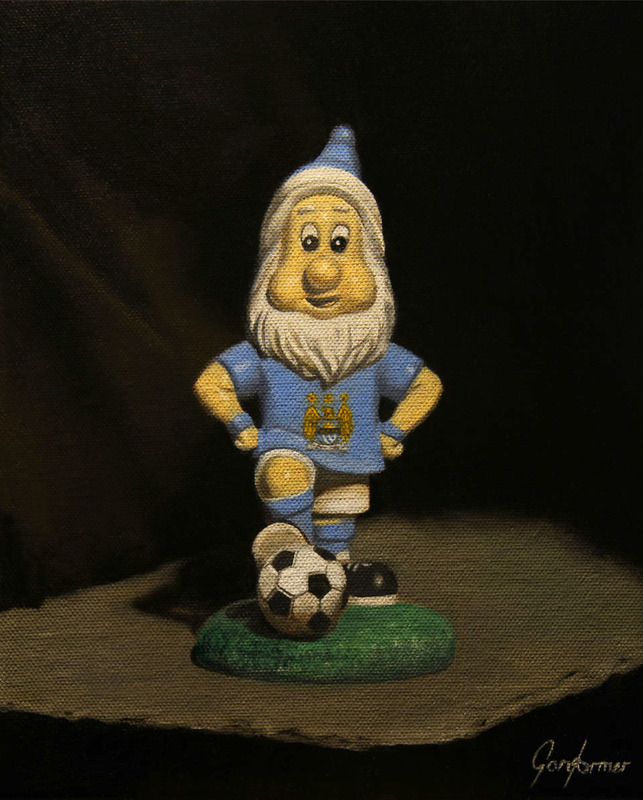 Notes | A cheeky looking garden gnome stands proud in this contemporary still life decked in the sky blue and white of City. Sporting an older variant of the team’s crest, this piece of football memorabilia harks back to seasons of mediocrity for a club which has now transformed into one of the most affluent in world football with the potential to dominate both domestic and European competitions. Notes | Euro 96 for many England fans remains one of the greatest (and most painful) tournaments that they’ve experienced and for children growing up at this time in the mid-nineties football stickers, collectables and freebies from breakfast cereals are still remembered fondly to this day. Notes | The actions of certain players on and off the football pitch make them cult heroes whose image is replicated (not always accurately!) in all manner of memorabilia. 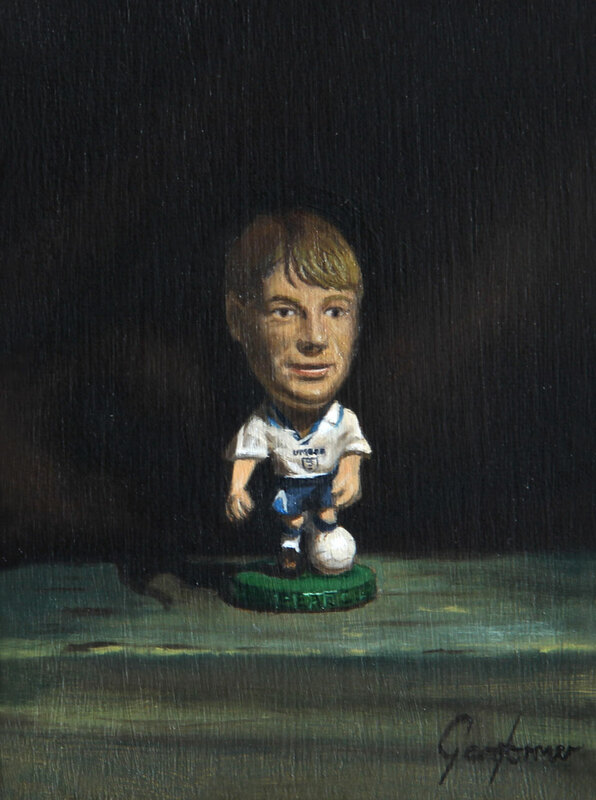 Notes | The chiaroscuro in this small piece tries to create an atmosphere and sense of drama to elevate this tiny figurine in homage to a player who was one of the greatest of his day. 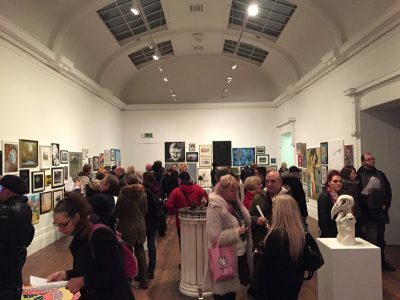 Subscribe to the artist’s newsletter for updates on the Football is Still Life project including new paintings, exhibitions and events.